After a turbulent 2016, Kanye West’s new line swapped spectacle for subtlety. It was a step towards what he’s promised all along: goods for the people. 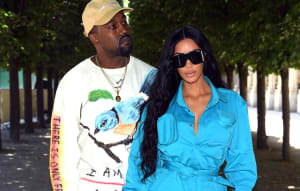 On Wednesday, Kanye West went against custom: he decided not to appear at the end of his Yeezy Season 5 presentation, bucking a long-practiced tradition for fashion designers when debuting new work. Fittingly enough, the lead up to his fifth fashion presentation had also been pretty Kanye-less: no tweets, no streams, no snippets, no in-progress photo updates — a stark departure from his approach to presenting creative undertakings in the past, be they in fashion or in music. This time around, Kanye’s absence and lack of spectacle worked to a different end: he wanted the work — and only the work — to speak for itself. The show was held in a small section of a warehouse at Pier 59. Attendees were seated around what looked like a huge black cube, onto which models dressed in full Season 5 looks were projected. The images rotated in a slow 360 degrees so attendees could take in the details of each ensemble — an experience uncannily reminiscent of character selection menus in video games, a consideration not lost on Kanye. It was a consumer-first approach that did not detract from the collection as the main focus, one that allowed for the most comprehensive understanding of every piece before investing in it. The projected models eventually hit the runway IRL for the second half of the presentation, capping off the 15-minute showcase. Despite the suggestion of a Drake and Kanye collaboration, in addition to constant web-whispers about Turbo Grafx 16, there was no new music offered up for consumption. Instead, The-Dream’s demo for J. Holiday’s “Bed” was reworked into a mesmerizing loop by DJDS, soundtracking the entirety of the show and demonstrating an intentional shift of focus back to the collection. The pieces themselves were not incredibly original or innovative, but were well done, self-aware and relaxed, channeling simplicity, pragmatism, and day-to-day wearability (a sharp pivot from earlier collections). We saw what appeared to be his first full foray into denim: light washes of slightly loose-fitting jeans and jackets paired with beautiful knee- and thigh-high boots. Athletic wear for men and women, long a staple within the collection, featured new additions to the oeuvre: adidas-branded Calabasas burgundy sweats, and others in turquoise, black, and variations of camo. A new runner hit the runway, too. Save for select statement pieces, like the one floor-length fur coat, or what looked like a skin-tight black bodysuit, nothing felt over the top. Most looks and individual pieces were meant for real-life everyday wear.